Welcome to an update with Simon Middleton from Shackleton Design and Manufacturing, who sell knitwear, outerwear and banjos (as you do). Oh, and do watch out for the extra bonus question, and please answer it in the comments if you can! We first met Simon back in September 2013, when I joined my first ever KickStarter campaign for producing a new British banjo. The company expanded into building a traditional British brand in clothing, as well as the banjos, and things were going well when I re-interviewed Simon in December 2014. At that point, these were his plans for the next year: “A year from now we will be a fully fledged men’s leisure brand, exporting to several countries. We will have electric guitars as well as banjos being made here. We’ll have added food products and outdoor gear to our Shackleton range. I’ll be (I promise) better supported, more relaxed, exploring new ideas. And I will be close to finishing my book about the journey! And hopefully will have published my long-standing children’s novel.” Well, that was a lot of plans for one short year – let’s find out how he did! Hello again, Simon, and it’s lovely to meet you again. So, are you where you thought you’d be when you looked forward a year ago? Well we’ve actually moved the brand and company even further forward than I had hoped when I spoke to you a year ago. Not all the plans we had ended up being pursued, but other more exciting ones took their place. We set out a year ago to raise £500,000 in equity funding, and we’ve just achieved that, plus a second highly successful KickStarter crowdfunding campaign. We now have a much broader range of handmade banjos being made in our factory in Norwich. I’ve been joined by four more staff in the past twelve months, a Commercial Director who is running the business alongside me, an Operations Manager who handles day-to-day operations, a Digital Marketing apprentice who handles our social media, and a very experienced fashion designer who has developed all of our clothing designs. Those developments have allowed us to create our first complete clothing collection, which is all made in Britain and includes outerwear, knitwear, shirts, boots and accessories. The range is growing all the time. We are now stocked in four London stores, including The Natural History Museum and The Dandy Lab, and we have our own Norwich shop and our online store. We have taken part in a range of fashion trade shows and have been featured in fashion press, and I was recently named one of the UK’s Top 100 Manufacturers for 2015 by The Manufacturer magazine. We’ve combined our banjos and our fashion and lifestyle products into one website www.shackletoncompany.com and we have a new visual identity, and new product photographs. I wish I had known that the process of raising funding wouldn’t be anywhere near as difficult as I’d anticipated: I needn’t have worried so much! And I’ve learned that the founder alone can only take a business so far. The most significant moment of the year was meeting and then hiring my Commercial Director. I would just restate what I’ve always believed, that a strong brand story told with absolute conviction is your strongest asset by far. Get the story straight and make sure that it’s distinctive, authentic, and emotionally compelling, and everything else follows. *** Extra question: What question would you most like to ask your fellow small business owners? It’s true that I run a small business, but I don’t see my job as running a small business. My job is to create an internationally recognised brand, so I don’t tend to focus on the small business sector. The people I’d rather ask questions of and learn from are those who have created breakthrough brands. I’d ask those people how they made the critical decisions about what “not” to do. There are so many possibilities at every stage that it seems to me that the most important thing to decide is which things to not pursue! But making that decision is far from easy. A year from now we intend that our profile will be much higher. We will close to opening our first London store, we’ll have a new website, and we will most likely have engaged a professional PR company, communications agency, and the beginnings of a trade sales team. We will also be about to launch our second collection, this time moving from premium to luxury clothing. Simon’s really been going from strength to strength with Shackleton in the last year – from banjos to boots and more. It’s interesting that he’s answered Yvonne Donald’s Extra Question from last week’s interview as he’s answered my questions (that is totally coincidental, as they sent their replies at the same time!). The order in which they are hiring people and growing and developing is very interesting, and surely a template for other similar companies. You can find Simon and everything to do with Shackleton Design and Manufacturing at www.shackletoncompany.com. Update Jan 2017: Simon has now passed the company on into a pair of safe hands. Welcome to a small business update chat with cake-maker extraordinaire, Yvonne Donald of Kake and Cupkakery. Yvonne’s first interview was in September 2012, and caught up with her in October 2013 and then November 2014. At that point, when I asked where she wanted to be by now, Yvonne replied, “Kake and Cupkakery, one website instead of two: I’m very excited about that. I want to focus on doing some online tutorials and face to face workshops for home bakers and those more experienced. I still want a shop front that will be a bakery and that is still a work in progress. Basically, I want to continue to take the business forward. It’s here to stay, and no going back.” Fighting talk there, so let’s see how Yvonne is doing! Hello again, Yvonne! So … are you where you thought you’d be when you looked forward a year and a bit ago? I think looking back at my answers, I had set myself some clear goals which I wanted to achieve to establish the business, and excluding the shop front I feel like I have progressed quite a bit and come a long way. I now have just one website (which I am proud to say I built myself) and have closed the other two sites. I’ve also had another logo redesign. The previous logo I realised didn’t properly represent me or my business, so I had a proper consultation and rebranded, and its exactly what I wanted, a simple design that does what it says on the tin. I’ve done a couple of tutorials using Periscope [an online service where you can post tutorials and other video content]: that was interesting. I’ve yet to properly venture onto YouTube, but I’ve also focused on my blog and have produced some tutorials on there which have gone down very well and got a nice lot of hits, as I post links to my blog posts in specific cake forums and groups on social media sites. I’ve found a kitchen for the workshops, but have been too busy to prepare any! I did do a children’s one, which was fabulous and is another market to explore. I am still juggling the full-time job with my business, and people are always amazed how I do it all, but in reality a lot of cakers start and work this way, so I will just need to continue to be disciplined, build leverage and get on with it. Back in the early part of the year I began supplying another coffee shop, I didn’t think I would again, but I did and soon realised that this is definitely not the route for me and the business. Being a wholesaler is challenging and time-consuming, and the commitment is huge, I decided to give notice on the agreement and go back to focusing on my core business of supplying the end-user and not supplying another business. There is a real market for this, and I know some businesses are doing it very well and that is their core business model, but it’s not for me at this time (never say never). I also felt I was neglecting my core customers, and if it wasn’t for them there wouldn’t be a Kake and Cupkakery, so they deserve my full attention. I was recently nominated as mentee of the year for by the IOEE (the Institute of Enterprise and Entrepreneurs), is an organisation that provides mentors for small businesses, and I was invited to an event to celebrate this as well as being asked to give a talk on my experiences. Considering it was to a room full of bankers, I wanted to convey my passion for my business and think I did OK. I entered the Flavours of the Neighbourhood competition back in February with the Hotel indigo chain, which was great for exposure. And once again, I was a National Cupcake Championship finalist. I entered at the last minute, so that’s three years in a row, always a finalist never a winner (I’m like the Leonardo diCaprio of cupcakes: he’s always nominated but has never won an Oscar). I’ve also really focused on my blog, which is getting some big stats as I’m posting in specific cake groups so that’s been good and very enjoyable, even though I’m a few blog posts behind. Basically I’m so busy that I spend more time working in the business than on it, but everything is ticking along nicely, my head is full of ideas and areas to explore but there aren’t enough hours in the day. I really couldn’t be more pleased how everything is going. I’ve learnt to listen to my gut, don’t be afraid to say no, (this is a recurring lesson) and to set clear boundaries for myself and the business. Even though my business is run from my registered home kitchen, it is too easy to answer emails and calls/texts at all hours or try and take on more orders that I can manage etc. I realise this isn’t good for me, and sends the wrong message to my customers that I’m always available or that I can pluck a cake out of a hat. One of the biggest things I’ve learnt is how productive I can be before 7am; I’m hitting the gym at 6.30am before the day job to get in some me-time, or doing a bit of admin,so that has been a revelation. The social life could be better, as I do still make sacrifices (ask my friends) but it’s all for the greater good. I think no matter what business you are in, people will always buy from people. If they like you, they will more than likely love your business and not only buy from you but recommend you to their friends and family, so for me it’s so important to engage with my customers in whichever way I can, whether it’s face to face or through social media. I like to think I give 100%, and I want to continue to offer fab customer service as well as great cakes. The new question: What question would YOU like to ask other small business owners? I would like to ask other small business users … if you were to recruit your first employee, what do you see as being the most important role you would need to recruit to move your business forward? Would it be a finance person, marketer, operations, etc.? In another years’ time I think the main goal is to take a massive step forward with Kake and Cupkakery being my full-time job. All the other times when I thought I was ready, I really wasn’t, but now I feel more established as a business and a little local brand, the winds of change are beckoning to help me sail on out to my next adventure. Yes! I think it’s time, don’t you? The thing I admire most about Yvonne, apart from her extraordinary work ethic, is her willingness to get out there, whether that’s asking Alan Sugar for business advice (see her blog) or entering competitions. I think she’ll go from strength to strength once she branches out on her own … watch this space (and if you need any cupcakes, celebration cakes and layer cakes, you know where to go!). You can find Yvonne and Kake and Cupkakery online at www.kakeandcupkakery.co.uk. She’s also on Facebook, Twitter and Pinterest. Hello again, Amelia! Are you where you thought you’d be when you looked forward a year ago? I think so, or at least well on the way! It’s been a really busy year, I’ve been steadily growing my client base and at the same time becoming more secure about what I’m doing and creating with my business. I’ve really niched down in my offerings. Before, I was a bit of a jack of all editing trades; I was offering all the services I used to perform while working as an in-house editor – which was a lot! But over the second half of this year I’ve become much more specific and cut out a lot of the things that I don’t enjoy. This allows me to be more engaged with the work I’m doing, and helps my clients by not overwhelming them with a thousand different services. I’ve also dipped my toes in the water of outsourcing and working with virtual assistants (a god send! ), started email marketing, joined a small mastermind, and I’m working on two products, one of which is a bit ambitious (why not!) and the other I hope to launch in the first half of next year. I’ve learned how important it is to say no, and to create boundaries in your business. When I started out, I would very rarely refuse a project, and I ended up spending time on things that weren’t as profitable or enjoyable as they could have been. It’s actually really powerful to be confident in saying no sometimes, because it frees you up to focus on areas that are important and ultimately much more rewarding. I think it’s super important to know your own mind, and what you want to achieve. I’ve had a lot of business advice over the past year from friends and mentors, everyone has an opinion about what you should be doing and how you should develop and grow. It can be overwhelming, so I think it’s important to know exactly why you went into business, for me it was freedom and autonomy, and what you want to achieve with it. It helps you take everyone’s advice into account but stand firm when it comes to your personal goals. And deciding what they are in the first place can be tricky! That’s a great question, because for the first time since I started I’m setting goals and intentions for next year. I feel like I’ve got ground beneath my feet now, and I can start building. I would like to niche down even more, and package my services into something very specific, with my products to go alongside. I keep overhauling my website, it’s quite basic at the moment but I’d like to create an online home I can be really proud of, and which better serves my clients and readers. I’m also setting revenue goals so that I can improve on last year and continue to grow. Here’s to an exciting 2016! I firmly believe that specialising and learning to say no are two hugely important tasks as you develop your new business – I’ve certainly refined my offering since I started, as well as branching out into new areas to test the waters. I think Amelia’s definitely going in the right direction, and I look forward to seeing how she does in the next year! 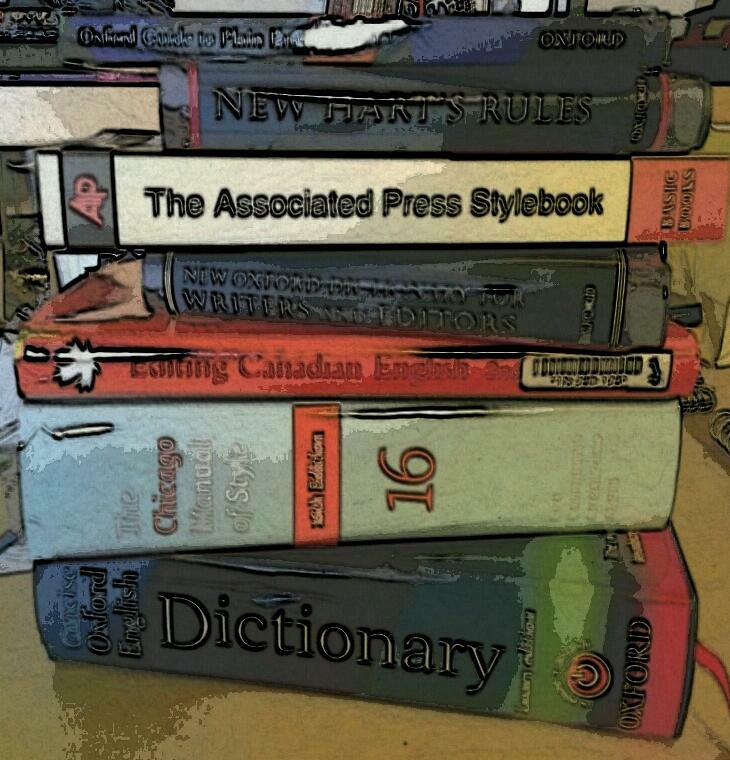 If you work with a proofreader or editor on any project, either for a publisher or working independently or as a student, you might receive a Style Sheet from them with your corrected work. This article explains what a style sheet is, the purpose of a style sheet, and what might be included on it. I’ve also written this article to send to my clients so they understand what the document I’ve sent them is – so if you’re one of my clients, hello! To make this article easier to read, I will refer to the person who has worked on your document as your “editor” – although I might refer to proofreaders in some places, too. If you’re an editor or proofreader who wants to find out more about style sheets, I’ve written an article just for you, too. A style sheet is a list setting out the decisions that your editor has made on aspects of the layout and language of your document, in order to keep the document consistent. It might include notes on what font is used, whether the text is left or fully justified, how particular words are capitalised or hyphenated, how much indent your indented quotations have, what is put in italics, etc. We’ll have a look at an example later on, but that’s a very short summary. Why use a style sheet? Especially if you’ve learned English as a second or other language, you will know that the English language is not consistent, and it doesn’t even have proper rules for some things! This can be really frustrating, as two people might do things in two different ways, BOTH of which are correct. are you going to use 20%, 20 per cent or twenty per cent? are you going to describe America as America, the United States, the US, the USA, the U.S. etc. etc.? are you going to use double inverted commas for quotations and single inverted commas for concepts, or vice versa? Now, the important thing with all of these is to keep it consistent. Some of these rules might be set down in a style guide or referencing guide (see below). But whether you and your editor are working to a style guide or not, it’s useful to have these decisions written down in one place for you both to refer to. What’s the difference between a style guide, a referencing guide and a style sheet? A style guide is a specific guide to how to deal with things like the above decisions – famous ones include Oxford Style in the UK, APA Style and Chicago Manual of Style and AP Stylebook in the US. 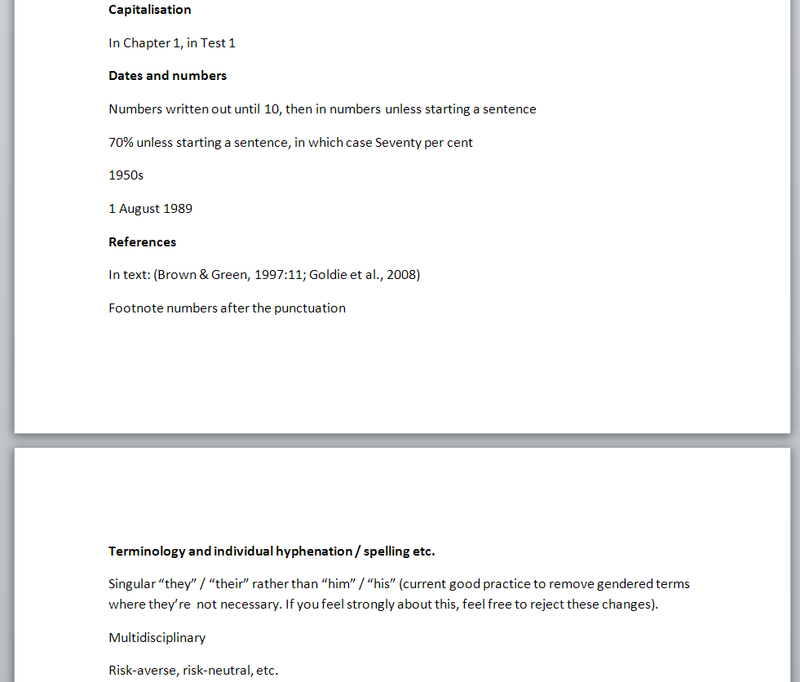 A referencing guide is a specific way of writing out references to work you are talking about in your dissertation or book – an example is Harvard referencing. Some universities and many publishers and marketing agencies etc. will have their own guides which documents published under their name or submitted to them will have to have. In this case, I could do without a style sheet and just refer my client to … well, a massive website or a giant book. Maybe not. In that case, I’ll note which style guide or referencing system I’ve used and still write out any important points which will impact the document in question. 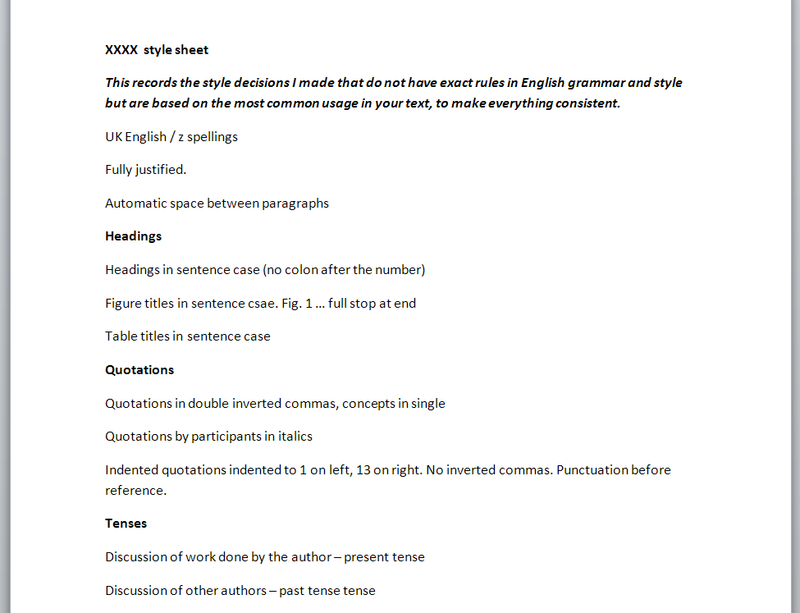 Please note that I (and I imagine most editors) have favourite style decisions – I prefer orientate to orient, for example, and where there is no clear preference in the text, I will go for my preferred option. If, however, the text itself has 33 orients and 2 orientates, I will go with the majority. This also means that some parts of the following examples might jar with any editors reading this – they are only examples! What should I do with the style sheet my editor has sent to me? Good question – now you understand why your editor has sent you a style sheet and what it’s for … well, why does it matter and what should you do with it? It will help you to understand some of the changes your editor has made. If your editor has just edited one chapter, they might send you the style sheet with that chapter and ask you to look through it and check you agree with everything on it. They might even send over some queries – if it’s not clear which option my client prefers, I will highlight the choice and ask them to look at it. If you don’t agree, let them know straight away, then they might change it if it’s not a rule of grammar that can’t be flexible. If your work is going to be edited by more than one person, they will share a style sheet to make sure it is edited consistently. If you are planning to add to the document, you can make sure that any additional text you write is consistent with the text that your editor has already checked. If you have been through edits and your document is going to be proofread, send the style sheet to your proofreader, then they will know what choices the editor has made, and will be able to look out for any errors much more easily. In this article, we’ve learned what a style sheet is, why it’s used, how a style sheet is different from a style guide and referencing guide, but backs them up, and what to do with a style sheet when you’ve been sent one, as well as seeing an example of one. I hope this helps you: do comment and/or share this article using the sharing buttons below if you’ve found it useful! Welcome to another Small Business Update, oh, and it’s with me! I always take the quieter slots around Christmas and New Year slot for myself, because it doesn’t seem fair to leave someone else languishing here, and I find it an interesting exercise in setting objectives and seeing what I’ve been up to. I started doing this in December 2011, then updated in December 2012, December 2013, and most recently, December 2014. At that point, this was my plan for the year ahead: “I will be reading more: my reading slipped a bit this year and that’s not good. More on my reading blog on 1 January about specific reading challenges for 2015. I’m getting back into my running and hope to be running longer and more regularly in 2015. And I aim to keep up with my crafts a bit more. I’ve already ramped up my volunteering to include parkrun and I’ll be making sure I keep up with that and other volunteering activities. I want to finish writing up a longer-form version of my Iris Murdoch research and getting that out there somehow, whether that’s placing it with a publisher or creating an indie book again. Wow – that was a lot, let’s have a think about what I actually achieved. Reading more – Yes, achieved! I read 10 more books in 2015 than I had in 2014, and I wrote a report about it over on my book review blog, here. Running longer and more regularly – Yes, achieved, I joined Kings Heath Running Club and have made some lovely running chums at my pace and distance. I ran four half-marathon distances, once a month from October, and got a personal best time in the Birmingham Half Marathon and at parkrun in December. Crafts – Not really. I made a small stuffed Christmas tree for a Crafternoon in aid of Mind, and did some colouring in. Running and the gym were great relaxation tools for me, though. Keeping up with volunteering – Yes! I continued volunteering for parkrun, winning a certificate and commendation from my running club for the efforts I put into that. I continued to help out at Social Media Surgeries. I ramped up the volunteering a bit when the Conservative Government got into power and started eroding the support for the vulnerable in society even more: I joined and helped with a local Action for Refugees group and also offered my editing services to a few volunteer groups pro bono, and should start doing stuff for them in earnest soon. I also helped collect up some goods for women’s refuges and homeless shelters that were being helped by friends in the running community. Finish writing up my Iris Murdoch research – The research is almost finished but I’ve been stalling writing it up. Create a self-mentoring guide for editors, produce a self-mentoring guide to go with the original books and put together a guide for authors on working with editors – I’ve half-done the self-mentoring guide for editors and that will inform the self-mentoring guide to go with the others. I’ve canned the working with an editor guide, it just doesn’t fit in really with my business books theme. Not much has really changed in terms of the work I do. I lost one big contract because the agency I was doing the work for lost the contract – nothing to do with me and a hazard of working with companies in between you and the client. I managed to make up most of the work. One thing that really changed was that I’ve earned a bit less this year, because I’ve had MORE TIME OFF! My new hobby of running has taken up time at weekends, doing all sorts of fun things like travelling around doing cross-country races, and I’ve ended up taking whole weekends off quite a lot. This is A Good Thing. Another change was that I moved all the detailed info on my business (and cholesterol-beating) books to their own website, Liz Broomfield Books, back in August 2014. I have had some guest posts from other writers and tried to keep it up with reviews and other bits of news being posted. I forgot to mention that last year, so that’s one change for the last couple of years. While we’re on websites, this one continued to flourish. I’ve kept the small business chats going, and I’ve been blogging about social media stuff a bit, as well as Word and business tips. The blog has seen over 1,000,000 hits in the past year (although that meant I had more people contact me about guest posts!). I’m not sure that much has changed or provided learning experiences for me this year – the business has settled down, most of my work is from regular clients, and it all runs fairly smoothly. I’ve proved the world doesn’t end if you go on holiday, have flu or take weekends off. I’ve also learned that however mature your business is and however smoothly it’s running, you do still end up working every evening after dinner for a week somewhere in the year. I said this last year, too – trust your gut instincts. I didn’t, and I ended up in a slightly difficult situation which I have now resolved, but took time and energy. Also, overthink your terms and conditions. Even if you don’t think somebody could possibly ask you to do x or y that you wouldn’t be happy to do for whatever reason, that doesn’t mean somebody won’t do that. Write it into your terms and conditions before you have to face that situation. And watch your jargon – you might know what you mean when you send a customer accompanying information, but think about it from their point of view and explain what you send to them in clear terms. OK, I’m going to be reading more because I started to make more time for reading over Christmas and I’m continuing with that. I’m going to keep running a half-marathon distance or more a month, and hopefully (very carefully and slowly) running a marathon later on in the year. I’m going to complete the self-mentoring for editors guide and produce a print and e-book version by the middle of 2016. I might write up my research or I might not! You can find me here, of course, and also on my books website and my book reviews one for more personal stuff. Happy New Year!